A Sixty-Year Spiritual Voyage on the Ocean of Dharma is a personal retrospect of Ven. Yinshun's long career of meticulous and wide-ranging scholarship. There was hardly a phase of Indian Buddhist literature that Yinshun did not explore and discuss in depth. His scholarly work, which is embodied in close to fifty volumes, extends from studies in the most ancient Buddhist canons to expositions of Madhyamaka and Mind-Only philosophy. These scholarly studies did not serve a merely academic purpose but contributed to his lifelong project of devising a truly contemporary expression of the Dharma. 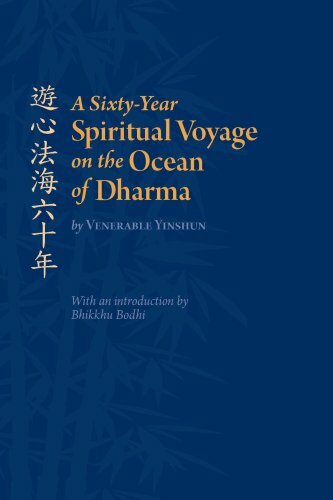 Sixty-Year Spiritual Voyage, which the Master wrote on the eve of his eightieth year, gives us a telescopic view of the momentous work of this prolific scholar as well as a concise statement of the conclusions he reached about the correct understanding of Buddhism in theory and practice. In the world of Chinese Buddhism, Venerable Master Yinshun (1906-2005) is widely regarded as the foremost thinker and scholar of the modern era. For Chinese Buddhists, confronted by the twin challenges of secularism and rival religions, Yinshun was the bridge-builder who connected Buddhist faith with modernity. He demonstrated the rationality and pragmatic validity of Buddhist teachings, its perennial values, the greatness of its vision and the vastness of its practical path. Almost single-handedly, he introduced the critical-historical method into Chinese monastic scholarship, spearheading a Chinese Buddhist intellectual renaissance and enabling Chinese scholar-monks to sit in forums with their academic peers from universities both in Asia and the West. He provided keen insights into the history and development of Indian Buddhism and erected, on the foundation of his extensive scholarship, the pillars of an approach to the Dharma that is both faithful to its Indian origins yet well-suited to the needs of the present-day world. His practical platform, which he called "Human-Realm Buddhism" offers an understanding of Buddhism that affirms the capacity of ordinary human beings to advance on the deep path to Buddhahood even while transforming and ennobling the communities in which they live.